Note: If you're interested in Tudor history, be sure to also read Elizabeth and Mary: Cousins, Rivals, and Queens by Jane Dunn (4 out of 5 stars). 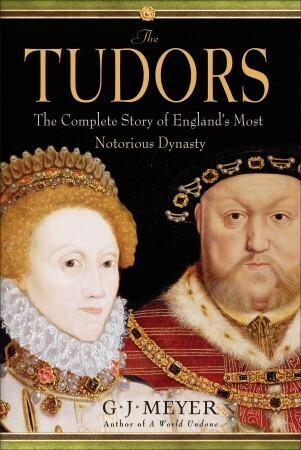 "For the first time in decades, here, in a single volume, is a fresh look at the fabled Tudor dynasty, comprising some of the most enigmatic figures ever to rule a country. Acclaimed historian G. J. Meyer reveals the flesh-and-bone reality in all its wild excess. The Tudors weaves together all the sinners and saints, the tragedies and triumphs, the high dreams and dark crimes, that reveal the Tudor era to be, in its enthralling, notorious truth, as momentous and as fascinating as the fictions audiences have come to love." "It matters also that both Henry and his daughter Elizabeth were not just rulers but consummate performers, masters of political propaganda and political theater." "None of the events that have made the second Henry Tudor the most famous king in history happened in 1534. Henry VIII divorced no one that year, married no one, killed no eminent person. But the year was a milestone all the same, arguably the great turning point in his stunningly eventful career. When it began he had deteriorated only enough to be the sort of person you would hate to be seated next to at a dinner party: arrogant, opinionated, a bully inclined to self- pity, invincibly confident of his own charm, and certain that he knew best about everything that mattered. Before the year ended he had become what he would remain for the rest of his life: a full-fledged tyrant in the strictest sense of the word, a homicidal monster, absurd, pathetic, mortally dangerous. A person in Henry’s predicament, a man whose pride has walled him up in such impregnable isolation, becomes incapable of an emotion as healthy as gratitude. Certainly he cannot see himself as merely lucky. His fate, he thinks, is coterminous with divine will. Everything good that befalls him does so in fulfillment of God’s great plan for the universe. Every disappointment can be traced neither to God nor to some failure on his own part (that is impossible; he could never commit a serious error) but to something outside himself that is cosmically out of joint. Nonetheless, lucky is what Henry was—one of the luckiest human beings who ever lived." A wonderfully researched and thorough look at England's Tudor monarchy. An especially impressive and accessible study of the period's key figure, King Henry VIII, who serves as the star of the book. Ultimately, this is the most interesting and largest section of Meyer's account as it gets the most of attention, but I really wanted to hear more about Mary and Elizabeth and their adult reigns. While the sections on Henry VII, Edward VI, and the disputed reign of Lady Jane Grey are shorter, the brevity understandably matches their less dramatic eras. May and Elizabeth, however, do feel short-changed. Both their bloodthirst and cruelty seem to reflect that of Henry VII's, but at the conclusion of the text I did not feel as well-acquainted with their personalities and motivations as I did with Henry's. For that reason, I immediately followed my reading of this book with a reading Elizabeth and Mary: Cousins, Rivals, and Queens by Jane Dunn (4 out of 5 stars) so I could get to understand these female monarchs better; I was not disappointed. The details about the violent hangings and death-by-burnings committed by these royal figures is shocking, but Meyer does a fantastic job explaining the impact these monarchs had upon their kingdom. If you are at all interested in Tudor history, I highly recommend this book.